**** Chosen by Winner: Christopher T.
This Thor3 model features a black finished Bohler M390 blade and a matching black titanium handle. It offers lightweight skeletonized titanium construction in a one-piece integral handle design. 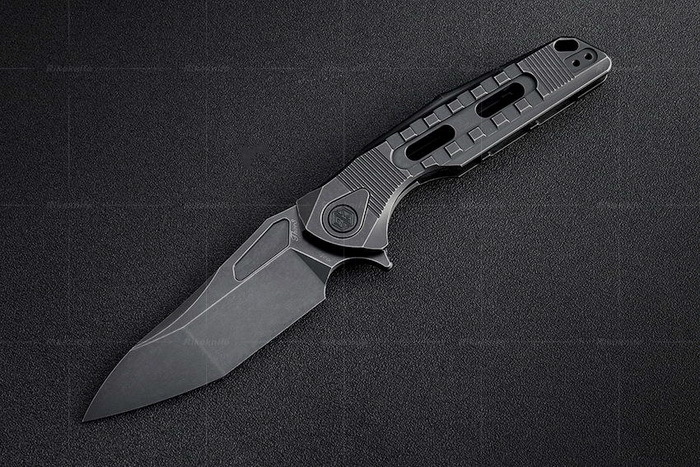 It sports a modified tanto blade with a flipper and jimping along the thumb ramp. The integral handle offers a sleek, heavy-duty profile with textured grooves and cutouts to promote a solid grip. A secure titanium pocket clip allows comfortable everyday carry. Features: Ceramic ball bearing pivot makes flipper, Integral titanium construction for a rock solid, durable build and Steel reinforced Titanium lockbar ensures dependable blade lock up. Rikeknife is an original brand designed by our founder Richard Wu. He is a long-time knife enthusiast, with a background in mechanical design and manufacturing, he constantly strives for excellence and detailed perfection in all the knife designs produced by Rikeknife. The brand name was derived from the first two letters of his name, then changed and named Rike. Rikeknife is an emerging original knife brand that is representative of high-quality Chinese manufacturing. Rikeknife Co., ltd is located in Yangjiang, Guangdong Province, China. We focus on producing high quality knives, Starting from the processing of OEM/ODM knives, we have gradually created our own brand Rikeknife. Our factory is equipped with state-of-the-art production equipment, a professional and robust production team, and capabilities for independent innovation through R&D. We are capable of producing the highest quality knives for any market, and we use only the best professional production equipment to achieve that objective. Such as; Wire EDM Precision Cutting, CNC high speed engraving machines, Laser engraving, Milling operations, CNC Grinding, Low Temperature Tempering Furnaces, custom hand finishing work, just to name a few. Our management, and production teams consists of seasoned professionals that have the expertise to get the job done. We are properly equipped for delicate work, all the way to the most demanding production and manufacturing requirements. We hold some of the tightest tolerances in the knife industry; excelling at all levels of production projects. We are always focused on the design and development of new products while remaining true to our core beliefs. At present , our products sell in the United States, Europe, Australia, Russia and other countries around the world. Our customers favor our knives for their superior product design and premium quality. Our mission is to provide products that are high in quality, excellent value, and best-in-class with customer service to bring you 100% satisfaction. At the same time, we welcome the idea of collaborating with customers all over the world to discuss product processing and OEM/ODM. We sincerely look forward to bringing Rikeknife products to the world stage through cooperation with our current and future customers for a more brilliant future together!